Hope all is well. It’s been a minute since I posted a blog, but I’m back. Been pretty busy between various music projects, work, fam, life, etc. This post is sorta related to the last few as its on the subject of how we, as musicians, compose music and the tools we use. Two days ago I happened to be reading an article on world renowned electronica musician, Tom Jenkinson aka Squarepusher in Future Music Magazine #235. He has a new release entitled “Squarepusher presents: Shobaleader One”. I’ve featured a track or two of his on my podcast The Sunday Soundtrack. Being a solo artist until this new release, he’s greatly relied on hardware to produce his tracks. He’s relied on the Yamaha QY700 up to now to handle all his sequencing. Even with the employment of actual musicians for this release, he’s still using it for that task. That, ironically, reminded me of a thought I had just a day prior… about a hip-hop producer I connected with on Twitter that graciously shared with me a slew of drum kits and samples. One file alone contain 1600 snares….1600! I thought to myself…”How would I ever be able to audition all of those snares in a somewhat timely fashion to find “the right one” for a tune?”. Ever since getting Logic Studio and an MPC shortly after that, I’ve been collecting samples and loops on the net (from the vast majority of free ones offered) for quite a bit of time how. So far to the tune of about 5GB alone. This doesn’t include the sample CDs that come with my monthly purchase of Future Music Magazine, and occassionally Computer Music and Music Tech. I’m in a moment of time where I am seriously enjoying using Logic Studio as my DAW of choice, but at the same time, there’s something about pressing buttons, turning knobs, and seeing the glow of LED and LCD screens in the studio, that makes it all part of composing music (not to mention picking up one of my guitars or my bass guitar as starting points). 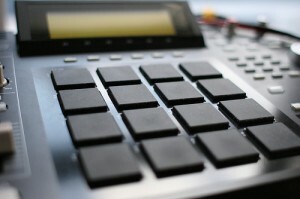 The hottest composition tool that, in my mind, is a mix hybrid of hardware and software is NI’s Maschine. I won’t even begin to get into this right now, but it is what’s on point right now. Tons of videps all over the net, big time artists using it. Many have made the jump from the MPC to this unit. “My advice to anyone who’s reading this would be: Don’t worry about what I’ve got. Don’t worry about what anyone else has got. Take whatever’s in your studio and make music. The most important thing is that you keep the free flow of ideas. Keep pushing your imagination. If you can only afford two bits of gear…fine! Use them, push them as far as they’ll go”. Am I an advocate of the above quote? Yes, definitely… but at the same time, I am hardly against buying new gear at all. While I had enough hardware in my studio to make music without a Mac, I found that using a computer easily made the process and workflow MUCH easier and quicker. Thanks for the read… now go make music. Peace. This entry was posted in Logic/Logic Pro/Logic Pro 8, Music Production/Studio Recording and tagged DAW, electronic music, Future Music, Logic Studio, Maschine, MPC, music production, producing. Bookmark the permalink. I like your take on the hardware vs software debate. I think that companies do a great job of making you feel inadequate about the gear you have. It’s got to be more, more, more. I had a chance to go to a studio where Dr Dre happened to be recording and he still uses the MPC 3000. It’s all about really knowing your gear. That’s the bottom line. The learning curve on new software can be real big. I am a victim of that. 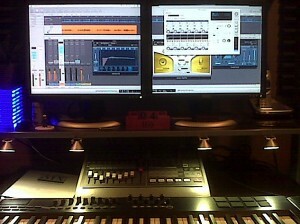 I used Protools for a long time but switched to Logic bescause I think the sounds that it comes with are just amazing. The learning curve is crazy though. The music tends to suffer for a while until you get a grasp of the new thing. I started with Logic 7.2 Express in ’07, then went to Logic Pro 8 shortly after. WIth rumors of Logic 10 coming, I feel I’m still at the tip of the iceberg learning Logic 8, so I defintely hear u on the learning curve thing, be it Logic, Live, Pro Tools, Reason+Record, whatever. All the DAWS these days are seriously powerful. I love Logic, collected tons of videos from YouTube alone, but the only way (I’m convinced from experience) to learn is to sit down in front of it and get busy. As always, the bottom line is to create music, not take a lot of time learning a software package.